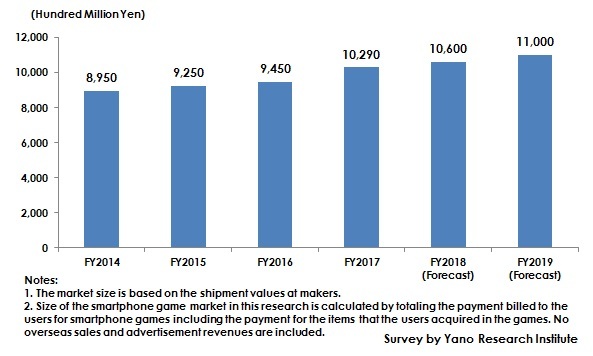 Yano Research Institute (the President, Takashi Mizukoshi) has conducted a survey on the domestic smartphone game market and has found out the latest trends in the market, the trends of market players, and the future perspectives. On the other hand, however, smartphone game market has rapidly become matured during the past few years, preventing many game makers from winning popularity in spite of considerable amount of investment and time spent to develop new game titles more than ever before. Currently, the existing titles continue their popularity even some years have passed since their first releases, so that it has become harder for new titles to become popular and make a big hit, regardless of whether they use major patents. In recent years, the games without conventional billing systems have made a great hit, one after another. For instance, “Pokemon GO”, with its magnificent popularity almost referred to as a social phenomenon, uses the combination of AR and positional information that has never used in games before. It has been widely accepted by broad range of customers, regardless of age or gender, who had not been familiar with smartphone games. On the other hand, Chinese game maker has domestically released “KNIVES OUT”, a battle royale game that allows from tens to a hundred of gamers to share the battlefield to fight alone or by teaming up until the last one survives. When teamed up with someone, the team can communicate via voice chat, which is one of the factors gaining popularity. These games have contributed to expand the whole market. In 2018, some titles of smartphone games have attracted attention by entering the category of eSports that had been limited to household games and online PC games. The number of users is expected to increase further, as the awareness improves and in the course of some attempts of making the games professional such as to hold gaming events mainly of the two big names “Puzzle & Dragon” and “Monstor Strike” where professional gamers compete with each other over the prizes. Smartphone games in this research indicate game application programs which can be played using smartphone devices, namely native game applications (gaming application that can be downloaded to smartphones), or browser games (web application games that use network). The smartphone game market size in this research is calculated by totaling the sales amount at game makers which are made up of the payment billed to the users for smartphone games including the payment for the items that the users acquired in the games. No overseas sales and advertisement revenues included.